It is the largest cultural celebration in the history of the modern Olympics, but you could be forgiven for letting the 2012 Cultural Olympiad pass you by so far. And if it conjures images of community dance projects and corporate sponsors holding up giant cheques at photo calls, you may be trying to ignore it altogether. But the figures are hard to dismiss. More than 16 million people are said to have been in or around performances so far and, between June 21 and September 9, the London 2012 Festival will give people 10 million opportunities to see events billed as World Class. If you hail from East London or perhaps even Middle England, the Olympiad seems to be reaching out to you. But no one is too urbane for this festival of inclusivity. Just by attending, say, David Hockney at the RA or Damien Hirst at Tate Modern, you will have taken part. Indeed, the cultural jamboree has co-opted numerous exhibitions taking place around the UK. And these range from the highly accessible (such as Paul Cummins’ roving English Flower Garden, made from 15,000 ceramic blooms) to the leftfield and arty (for example, Helen Petts’ Kurt Schwitters inspired show in Newcastle/Gateshead). And as this quote suggests, the Olympiad is an umbrella term for the work of a wealth of funding bodies, arts organisations – and corporate partners including BP, together with BT and Panasonic. The festival also breaks down into six thematic programming strands, which in turn break down to regional projects organised by a plethora of smaller arts organisations. London may be the focus but the structure reaches out across the UK. A reported £97 million is said to have been spent on cultural events since 2008. Set that against the conservative £12 billion estimate for the games themselves and the mounting costs of security (already said to be £553 million), and the cost of bringing in culture for the feelgood factor is a bargain. You could argue the more money involved the less artistic licence there is to go round. Projects that celebrate Britain, the Games, community have been onto a winner for the last four years. Projects that critique big business, the security arrangements, or the incumbent government are naturally less thick on the ground. This does raise questions about the function of art. Perhaps in its origins on the walls of various caves or in the apse of various churches, art was a focus for celebration. But since the 20th century, at the very least, it has more often made a point to shock, resist, question and explore. None of which would play that well at a street party or a village hall. Artists Taking the Lead sees nine regional spectaculars, including a knitted lion in Nottingham, a puppet Lady Godiva in Coventry and a column of cloud on Merseyside. These may well scare the odd small child, but they are hardly likely to frighten the horses. One artist meanwhile makes a point about climate change by towing a small island from the Arctic around the South West coast. Critics would point out the Olympiad’s PLC partners. No less problematic, in its way, was the decision to enlist 12 contemporary artists to turn their hands to poster design to come up with a dozen images for both the Games and the Paralympic Games. Results were mixed, but did offer a chance for the ‘that’s not art brigade’ to get on board. 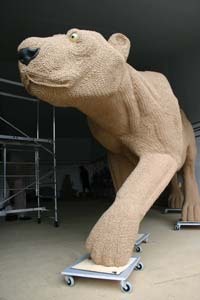 They should also be out in force when the four public sculptures commissioned by Frieze go up at sites near to the Olympic Village. Seeing this, artists will soon learn their place in the pecking order. In fact it’s a surprise they come before film. Without doubt music and dance will be the star art forms over the coming months. Music doesn’t need to be edgy to be interesting. It can be, for example, be based on the rhythms of a train or a table tennis game and still put a smile on your face. But neither art nor music can compete with geography for the most inclusive element in the Cultural Olympiad. One strand of activity is called Discovering Places and this challenges the public to find local hidden gems, 2012 species of flora and fauna and places which relate to all the competing nations. It is unpretentious, inspiring and, dare one say, quite sweet. Artists don’t appear anywhere. Who needs ‘em?